Private Cocktail Parties are what we do best at Amigos. When you book your Benidorm Private party at Amigos - One Person - usually the hen, birthday boy/girl, organiser or winner goes free* you get unlimited home made Sangria, (recipe) water on the tables at all times, decorations, exclusive use of the restaurant or roof terrace, your own chef and waiter and a proper three course lunch or dinner off our a la carte menu and your own music if you have it. The Private Parties normally take place in the afternoons between 1pm & 5pm or evenings from 6pm - 10pm. Normally for the evening parties you can stay later and purchase drinks after the party if you would like. If you want a wild, loud, mad drunken party - you're in the wrong place. 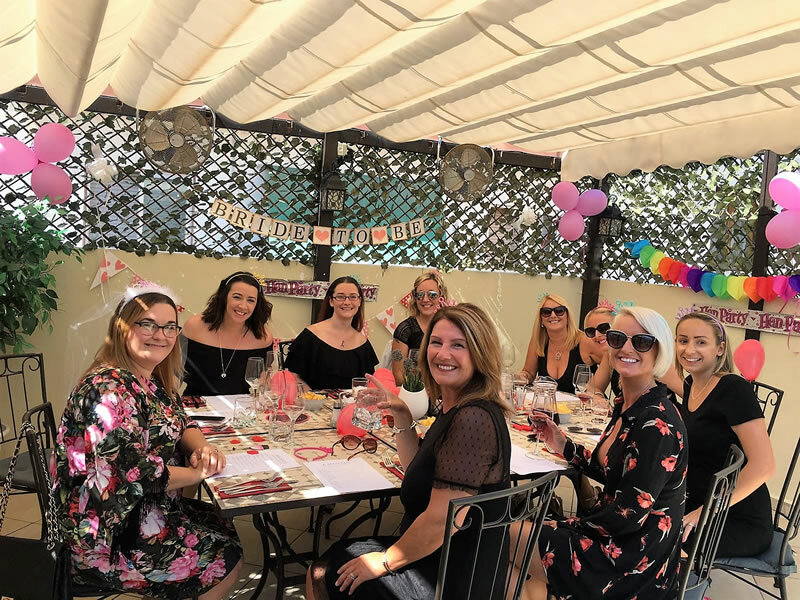 Amigo's Private Parties are about you, your family and friends, they are about celebrating a special moment in time where you can have friends and family all to yourself for 4 top quality hours and they're about friends and family having you all to themselves without unwanted distraction from others. *Any One Person Goes FREE - with 10 paying guests daytime parties or 18 paying guests evening parties. 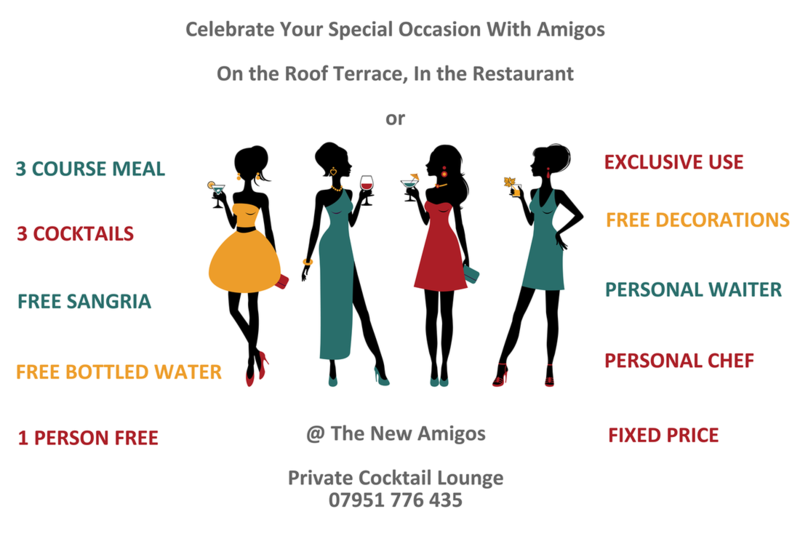 Note: You can still have a Private Party with less people but to have it exclusive the minimum spend must be met or we have the right to allow other people into the restaurant or onto the roof terrace. ﻿We can still cater for smaller parties - they just won't be in exactly the same format. Call +34 696 548 252 to discuss smaller cocktail parties. Freshly peeled Atlantic prawns in Amigo’s homemade lemon Marie Rose sauce. *Can be served without crab-meat. Served on a bed of tomato puree, basil, cherry tomatoes and a homemade pesto drizzle. Served on a bed of garlic and herb potato mash, with poached pear cooked in red wine, served with fresh veg of the day. Served on a bed of carrot, beetroot and roasted cauliflower and an orange and Tequila dressing. Also, served with a shot of tequila. For the evenings the price would be 85 euros per head with a minimum spend of 1,530 euros. *From May to November the evening "exclusive" parties - a minimum of 18 people are required for exclusivety. We will still give the full package to smaller parties but we hold the right to allow more people onto the roof terrace if the party is for less than 18 people. Please call to discuss this option with us on +34 696 548 252. 20 euros deposit per person required to secure all party bookings. Second time on the roof terrace this time to celebrate my birthday and a friends. A little Gem in Benidorm would definitely recommend Amigos. Booked this for my friends hen do after reading reviews on here and it was fantastic. We had the roof terrace to ourselves for the afternoon with amazing food and cocktails. We had our own waitress for the full afternoon who was excellent and we could play music and relax in the sun while we ate. Can't recommend this enough to make a hen do special, you won't be disappointed. It was excellent value for money for all that was included and all of us loved it! Reviewed October 20176 of us had a lovely meal here when visiting Benidorm . Food and service were excellent . We had a booking of over 20 friends for a special event & booked the roof terrace. The staff couldn’t be anymore helpful, friendly and attentive (especially Scott). The food was amazing and worth the wait, I can see some reviews have commented on the prices compared to other restaurants in Benidorm. However, if you want to experience amazing quality food & service then you should expect to pay that little extra. Plus it’s worth it. I had the minted lamb, it just came away from the bone and the gravy was to die for. They catered my request to have triple cooked chips rather then the mash and nothing was too much trouble. Thank you & see you again on my next visit to Benidorm. Having visited Benidorm for the fifth time for my 30th birthday I wanted the last night to be a cut above from the rest. I trip advisored the best restaurants and came up with one of your main competitors - and I'm ecstatic to say they refused my booking due to our (well behaved) daughter, because that meant we ended up discovering you. The entirety of the experience was exceptional. The roof terrace was beautiful, the lights and music complimented it perfectly. The staff were all so polite and knowledgeable and couldn't do enough for us. The service was prompt but at no point did we feel rushed - we were able to enjoy our evening. Wine amazing, food stunning and prices were very reasonable considering the portion size. This deserves to be the number one on trip advisor and I'll make sure I visit every time I'm back! A table was booked here for 23 of us as a surprise for my 40th birthday. The other girls were given instructions on where to go and to be punctual. As we walked do there was a board with my name it and we were greeted by the lovely Scott. We seated on the roof terrace and the room was decorated with banners and balloons. There was also a personalised cocktail menu just for my birthday which was a great touch. The food was amazing, I had the mushrooms to start and steak as the main. It was cooked to perfection and I didn't manage it all. The cocktails were strong and tasty and the sangria was free flowing. We had 3 staff waiting on us and I must apologise but I only remember Scott's name (might be because he was introduced to us before we started on the cocktails! ), he is credit to the restaurant and was extremely polite and helpful.